This 5micron sediment filter is made of 100% pure polypropylene fibers. High capacity filter removes dusts, particles and rusts. This granular activated carbon filter is composed of high-performance activated carbon that remove free chlorine, odor, organic contaminants, pesticides and chemicals that contributed to taste and odor. This block carbon filter is composed of high-performance carbon that remove free chlorine, odor, organic contaminants, pesticides and chemicals that contributed to taste and odor. 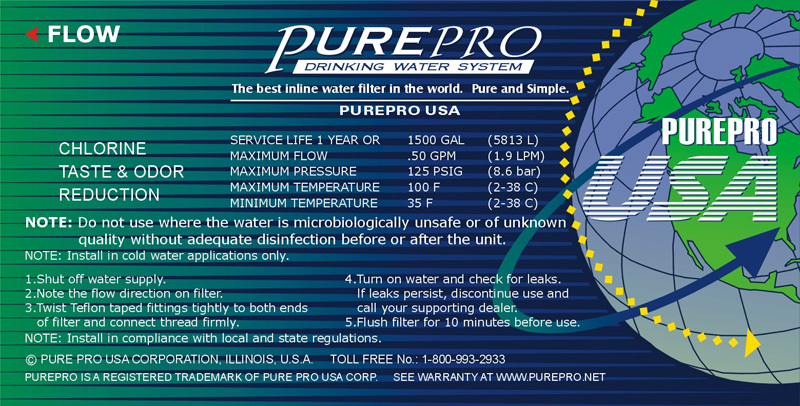 PurePro Membranes are made in USA. High rejection TFC type membrane with the capacity of producing 50 / 80 / 100 gallons per day. This membrane removes the following hard water contaminants that may be present in your water: lead, cooper, barium, chromium, mercury, sodium, cadmium, fluoride, nitrite, nitrate, and selenium. RO Series: TW30-1812-80 80GPD Membrane. Luxury RO: TW30-1812-100 100GPD Membrane. NSF approved. This post carbon filter is designed to improve taste. It removes any residual impurities and odors from the tank and provides a finer conditioning of pure water.